Bringing the Beach Within Reach! The Aquarium’s traveling Outreach programs bring fun, hands-on, educational activities to your classroom or event. Presentations can be adapted for all ages and for an array of different groups. Costumes, props, and LIVE ANIMALS make these programs entertaining, enriching and exciting for all ages! Outreach programs can put sea turtles, alligators, freshwater turtles, snakes, horseshoe crabs and other critters at your fingertips. Custom programs can be designed to meet the needs of any group or class. 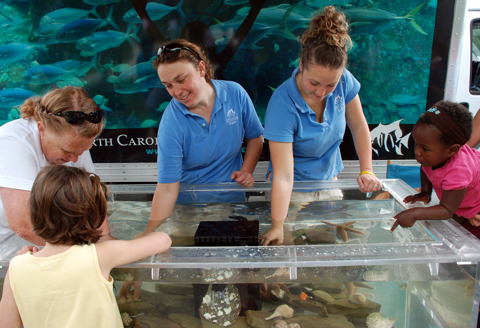 The North Carolina Aquarium at Pine Knoll Shores offers a number of exciting, interactive, hands-on outreach programs able to come to you! We can provide both small-group hands-on programs and interactive large-group programs for audiences of all ages and backgrounds. We incorporate engaging demonstrations, dramatizations, experiments and live animal encounters designed to inspire appreciation and conservation of North Carolina's aquatic environments. NOTE: Please list several program dates in order of preference.You may even list certain weeks when you are available. SMALL GROUPS: For 30 participants or fewer. $100 for the first small-group program, $50 for each repeated small-group program. LARGE GROUPS: For 31 to 150 participants. $200 for the first large-group program, $100 for each repeated large-group program. TRAVELING TOUCH TANK: $475 for four hours. TRAVEL: .75¢ per mile, round trip. Journey through North Carolina: River Basins of N.C.
Join the NC Aquarium at Pine Knoll Shores in learning about the amazing journey a sea turtle must take and all the obstacles they may encounter. Explore the life history and adaptations of these threatened and endangered species. This program includes an encounter with a live sea turtle. Great for all ages. Duration 45 hours. Looking for something to liven up your next festival or community event? 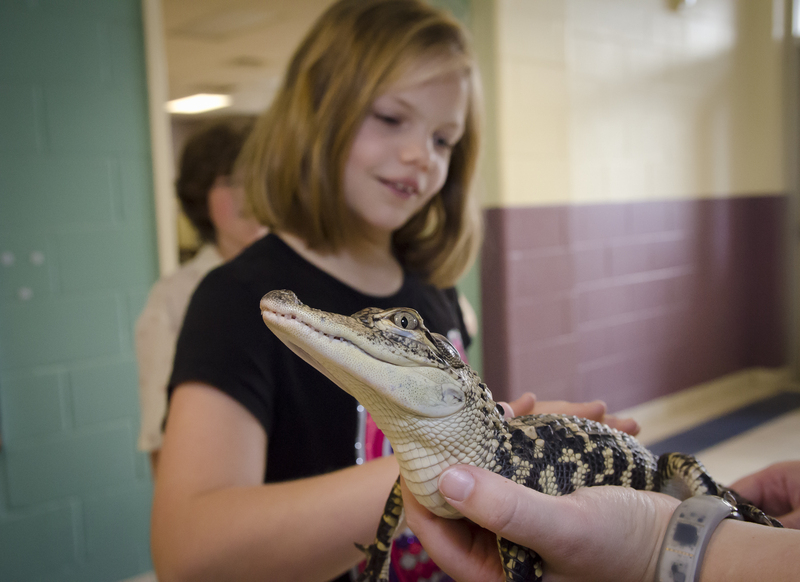 The staff sets up a fun, hands-on display to showcase some of the reptiles of North Carolina. Depending on the season and venue, a number of live animals come along. Education games, crafts and other activities can be part of your event upon request. Duration 4 hours. Bring the Aquarium to your next community event. The staff sets up a fun display that showcases different birds of North Carolina. You will get the chance to see and feel the wings of different native birds. Learn about why birds are so important and how we can be helpful to our fine feathered friends! Depending on the season and venue, a number of live animals come along. Educational games, crafts and other activities can be part of your event (upon request). Let us know what we can do for you! Duration 4 hours. Looking for something extra special for your event? You provide the event and the Aquarium provides an assortment of local marine invertebrates in our new traveling touch tank. The selection of touch tank animals depends on seasonal availability, but may include whelks, urchins, sea stars, hermit crabs, spider crabs, sea squirts, clams and tulip snails. The traveling touch tank exhibit includes a display of assorted biofacts, beachcomber finds and more! Duration 4 hours.